As A Stockocity 2 Customer, You Qualify For This Exclusive Promotion To Reseller Stockocity 2 - Your Cost Is As Little As $0.25 Per Account! You simply send the visitors to our sales page through your special reseller link and you earn 100% commission on their Stockocity 2 Membership purchase. You don't need to setup a website, buy hosting, upload a site template or setup a payment button. We'll take it from there. Once your customer signs up, we'll provide them with 24x7 access to our Stockocity 2 Membership site. You don't need to setup any tools, scripts or software. We'll support all of your customers from beginning to end. If your customers have any issues, we will handle them all. You don't need to provide any technical support. We'll host all 18,000 Full HD videos and cover the cost of cloud storage and bandwidth for all of your customers. You don't need to configure cloud storage, upload 900 GB of video files and you don't need to pay for recurring infrastructure costs. We'll upload 75 - 250 new FHD Videos to our Membership every month for your customers. All you need to do is send traffic, sit back and relax. Once your customer signs up for their Stockocity 2 Membership, we will send them through our upsell funnel and share the extra revenue with you, up to 70%. You don't need to handle anything except your profits! Is Stockocity 2 Easy to Sell? Stock Video buyers are used to paying between $10 - $199 for a single 4K video. As a priority Reseller Partner, you can sell lifetime access to the Stockocity 2 Membership for between $47 - $67. 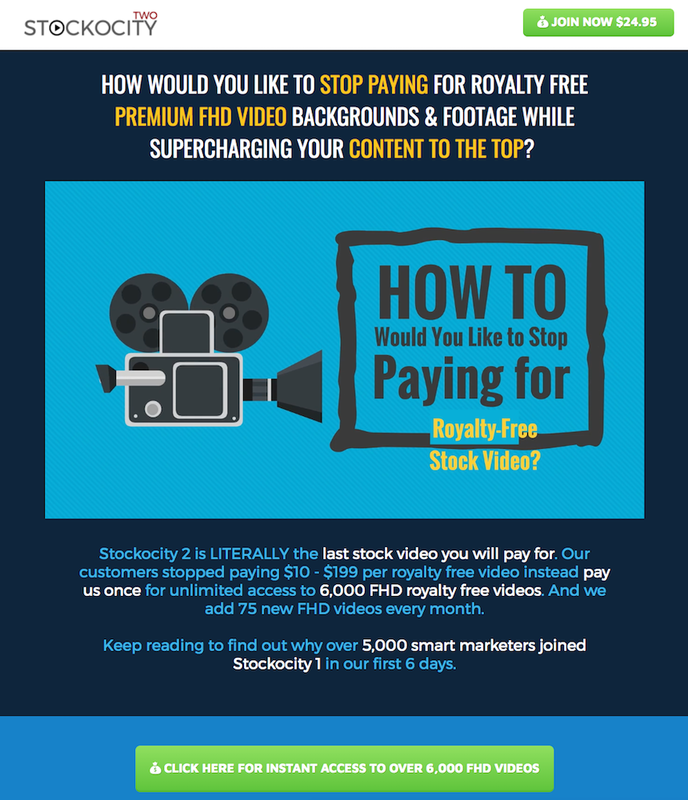 It's very easy to sell access to 6,000 Full HD videos (with 75 new Full HD videos monthly) when the one-time price is less than a single stock video at iStock, Pond5 or Shutterstock. We offer our priority Reseller Partners the ability to use coupons on their Stockocity 2 landing page - and we'll even add a coupon deadline timer to encourage your visitors to act fast. The one-payment price on your Stockocity 2 page will be $67 - you can leave this price or setup a coupon for your customers for $10 or $20 (bringing their cost to $47 or $57 one-time.) This will allow you to sell access to Stockocity 2 for less than we sell it! Through the Stockocity 2 24x7 Membership site, your customers can download videos when they want. Unlike other stock video "collections" or "fire sales" where they can only download hundreds of GB of badly named, uncategorized files, Stockocity 2 members can browse, keyword/tag search and preview all of the Full HD videos..
Our Reseller Partner offers allow you to resell our Standard Stockocity 2 Membership. This includes 6,000 Full HD videos, plus 75 new FHD videos monthly. After our introductory launch pricing, this Membership will sell for $67.00/one-payment. Sell 20 Memberships @ $67 . . . . . . . . .
Sell 50 Memberships @ $67 . . . . . . . .
You won't find an easier system to start making money now. Literally, all you need to do is sent traffic to your unique reseller link. We do the rest. Videos are eating the world. Unlike in the past, now using video in your marketing, social media and promotions is a 100% requirement. Your Reseller Account purchase from Stockocity 2 is covered by our 30 day no questions asked guarantee. If within 30 days of purchase you are not satisfied with your Reseller Account for any reason, we will provide a 100% refund - no questions, no hassles. YES! I WANT RESELLER ACCESS NOW! Can I Give Stockocity 2 away? ​No. You must sell the Stockocity 2 memberships. Since we are providing access to the videos and end-user support, we require that you send customers to Stockocity 2 through your unique reseller partner link. We will collect the revenue and distribute your 100% commission. This prevents fraud signups, spamming signups and account abuse. Can I Purchase Distribution Rights? No. We don't offer distribution rights for Stockocity 2 for many reasons, including de-valuing the content. Generally when a product offers distribution resale rights, there are a handful of resellers that release the content for a very low price which hurts all resellers. We don't play that game. Can I start selling these today? ​​This Looks Easy. Am I Guaranteed To Make Money? Can I set my resale price for Stockocity 2? Yes and no. We set the price on the one-time payment for Stockocity 2 at $67. As a reseller partner, you can offer your customers private coupons for $10 or $20 to bring the price down below our selling price. Pricing of Stockocity 2 may change in the future, but reseller partners will alway have coupons so you can offer the membership at a better price than the standard price. How Much Are Additional Accounts to Sell?